Columbia County, in southeastern Washington, has a population of 4,064 (in 2000), making it one of the more sparsely populated of Washington’s 39 counties. At 868.8 square miles, it is the ninth-smallest county in the state. It is bordered by Whitman County and the Snake River to the north, Walla Walla County to the west, Garfield County to the east, and the Oregon state line to the south. 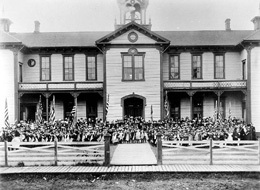 The mainly agricultural county was carved out of Walla Walla County in 1875. It is known for asparagus, green peas, and especially wheat, with ranching and logging also playing a significant role. Agriculture and food processing still dominate the economy, with manufacturing and government representing the majority of the county’s nonagricultural employment. 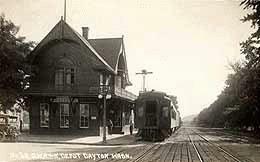 Dayton, the largest town and county seat, recorded a population of 2,655 in the 2000 Census. Dayton is well known for the historic preservation of its downtown. Northern Columbia County has rolling hills and valleys, with its lowest elevation of 504 feet on the Snake River on its northern border. Farther south, the terrain becomes rugged and forested, with the Blue Mountains rising to 6,401 feet at Oregon Butte in the southern part of the county. On October 12 and 13, 1805, Lewis and Clark canoed on the Snake River along the boundary separating Columbia and Whitman counties on the outbound leg of their expedition to the Pacific Ocean. They did not stop in the future Columbia County on the night of October 12, instead opting to spend the night in the future Whitman County at the mouth of Alkali Flat Creek. But on their return trip to St. Louis on May 2, 1806, Lewis and Clark spent the night on Patit Creek about two-and-a-half miles east of present-day (2006) Dayton. Until 1875 there was no Columbia County, just a large Walla Walla County stretching across southeastern Washington to the Idaho border. In October 1869 the first attempt was made to create a new county from the eastern part of Walla Walla County, but this effort failed. A second effort in 1875 was successful, and Columbia County officially came into existence on November 29, 1875. The eastern border of Columbia County at that time was the Idaho state line, but in November 1881 the eastern part of Columbia County was separated to form Garfield County. Blue Mountain Cannery was built in Dayton in 1934. At the time, it was one of the largest canneries in the United States. It had its trial run of canning peas on July 20, 1934, and during its first season canned up to 7,500 cases of peas per day. The cannery expanded in 1939 to accommodate asparagus operations. The Blue Mountain Cannery sold out to the Minnesota Valley Canning Company in 1947, and in 1950 began operating under the Green Giant label. The Green Giant Company was purchased by Pillsbury in 1978 and subsequently bought by Seneca Foods. In June 2005, Seneca Foods announced plans to close the asparagus cannery. Seneca retains much of the facility as part of its seed and agronomic research operation. The railroad town of Starbuck came into being in the 1880s. Starbuck is located on the Tucannon River about 20 miles northwest of Dayton. In its early years Starbuck was a division point on the main line of the Oregon Railroad and Navigation Company. At one time up to 24 trains a day went through the town. The early pioneers attempted to make cattle and sheep ranching the dominant industry in Columbia County. However, harsh winters and resulting food shortages soon took its toll on livestock. Wheat farms were established in the county in its earliest years and quickly became the dominant industry. Beginning in the 1890s, technological advances made in the equipment used to harvest wheat made it easier to produce even more wheat. Logging was another major industry in the first decades of Columbia County's history. Sawmills were built in the Blue Mountains, where timber was abundant; additional sawmills were built along local county rivers. Logging continued to play a role in the county's industry until the 1960s, though some logging mill owners made more money by turning to farming. By the late 1950s, the Lower Snake River Project was underway in southeastern Washington. It involved the construction of four dams on the Snake River, including the Little Goose Dam, which straddles the river between Columbia and Whitman counties. In July 1981 (on the 100th anniversary of the railroad's arrival in Dayton), the Depot opened to the public as a heritage building museum. It is the oldest surviving railroad station in Washington. Columbia County also has the oldest working courthouse in Washington state. Built in Dayton in 1887, it is on the National Register of Historic Places. It has been maintained throughout the years and was extensively renovated in the early 1990s. In 1999, the Downtown Dayton Historic District was placed on the National Register of Historic Places. This district includes 29 buildings (15 built before 1900) in a four-block area, and 117 buildings in all of Dayton. As the twenty-first century began, Dayton was becoming well known in southeastern Washington for its historical preservation. Agriculture in Columbia County is also changing with changing times. Wheat, peas, and asparagus continue to be the dominant crops, but now experimental farms are also growing new crops such as garbanzo beans and lawn grass seed.